We're kicking off my grand project of playing through every single Ultima game with the one that started it all, Akalabeth. Released all the way back in 1979 for the Apple II, making it the oldest game I've done a playthrough of by a wide margin. Essentially a crude Dungeons and Dragons inspired dungeon crawler programmed entirely in BASIC, Akalabeth was a programming project by Richard Garriott during his high school days. He had made a dozen copies to sell in a local computer shop, packaged in ziploc bags and with a photocopied manual. By chance one copy made its made its way to publisher California Pacific Computer Company, and they were so impressed with it that they brokered a publishing deal, kicking off his career as a game designer. In addition to being Richard Garriott's first commercially released title, it introduced a lot of elements that would later be seen in the Ultima series proper. In fact, its first person perspective and most of its graphics would be reused in the first Ultima game's dungeon segments, and Mondain and Lord British would both become prominent characters throughout the Ultima franchise. 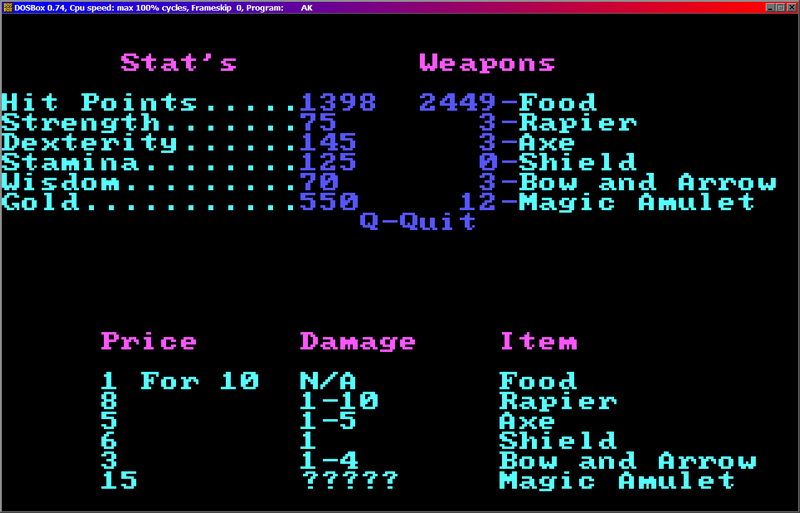 I'm playing the remake that came on the Ultima Collection. This version introduces color graphics (such as they are), MIDI music and a save feature. For the record, completing the game on anything less than difficulty ten just gives a slightly different ending message. Oh, and be sure to boot the game up again after you've cleared it and saved for an extra little bonus.